Apart from a humerus fragment of a pelagornithid bird from the middle Eocene of Mexico (González-Barba et al. 2002), there are no published bird fossils from the Paleogene of Central America. The Cenozoic avian fossil record of South America was summarized by Tonni (1980), but many Paleogene fossils were described after this study. The earliest specimens stem from late Paleocene (Itaboraian) marl fillings of the Bacia Calcária of Itaboraí in Brazil. The described fossils from this site belong to a palaeognathous bird (Diogenornis), a representative of the Phorusrhacidae (Paleopsilopterus), and a small, long-legged taxon (Eutreptodactylus). Some bird fossils were described from the Casamayor Formation of the Chubut Province in the Argentinian part of Patagonia. This formation was considered to be of early Eocene age by earlier authors, but the exact age of the Casamayoran land mammal age is now regarded uncertain, possibly spanning most of the early and middle Eocene (see p. 17 in Rose 2006). 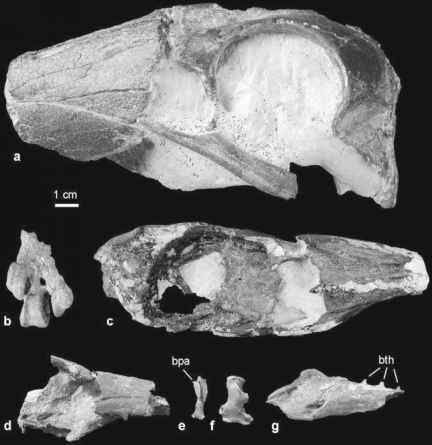 Avian remains are more abundant in the late Oligocene (Deseadan land mammal age) of the Santa Cruz Province of Patagonia (the Deseadan was assumed to be of early Oligocene age by earlier authors; see Berggren and Prothero 1992; Rose 2006). The paleoenvironment of these temperate latitude localities during the Oligocene was dominated by an open woodland savanna with river banks and floodplains (Webb 1978). Several avian taxa were also reported from the late Oligocene or early Miocene of the Tremembe Formation of the Taubate Basin of Sao Paulo State in Brazil. These lacustrine deposits consist of bituminous shales in which articulated skeletons are found, and layers of montmorillonitic clay that yielded isolated bones; the sediments were deposited in a shallow, alkaline lake (Alvarenga 1999). The first avian remain, a fossilized feather, was already mentioned by Shufeldt (1916).